Andrea Pirlo was born on 19 May 1979, in Flero, Italy, and is an Italian professional soccer player, best known as a midfielder for the A.C. Milan and Juventus clubs, who led the Italian national team to the 2006 FIFA World Cup championship. So just how rich is Andrea Pirlo? Sources state that Pirlo has acquired wealth of over $30 million, as of early 2017, accumulated during his soccer career which began in 1995, as well as through his personal businesses. Pirlo’s soccer career started with the Flero youth side, and then with Voluntas. In 1994, he joined Brescia Calcio, the region’s top youth team as an attacking midfielder, helping the team to win the Serie B title and gain promotion to Serie A in 1997. The following year he signed with the prominent Serie A club Internazionale. However, he had difficulties getting into Inter’s starting line-up, and was twice loaned out to other clubs, Reggina and Brescia. 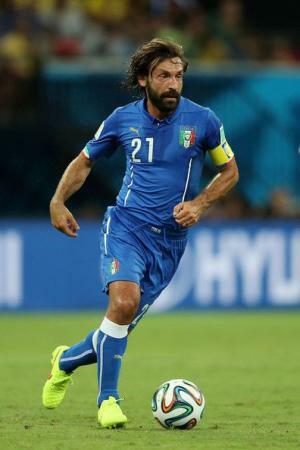 In 2001 Pirlo was sold to A.C. Milan for around €18 million as a deep-lying playmaker in front of the defense. During the following ten years, he established himself as a world class player, leading the team to win two UEFA Champions Leagues, two UEFA Super Cups, two Serie A titles, a FIFA Club World Cup, a Supercoppa Italiana and a Coppa Italia, building an outstanding reputation and amassing considerable net worth. In 2011 he joined Juventus on a free transfer, subsequently winning four more Serie A titles, two Supercoppa Italiana titles, and a Coppa Italia, earning numerous awards and honors, reinforcing his status in the world of soccer, and greatly improving his wealth. After his 20-year tenure with the Italian teams, Pirlo joined MLS expansion side New York City FC in 2015, as the team’s third Designated Player; this move made him the highest paid Italian player in all leagues with an $8 million salary. After a less than impressive first season, the 2016 season saw Pirlo leading the team to reach the MLS Cup Playoffs for the first time ever. Speaking about international level, Pirlo has played successively for the Italian teams at U15, U18 and U21 level, leading the latter to win the 2000 UEFA European Under-21 Championship, and being the top scorer of the tournament and so selected as the Golden Player. Two years later he joined the Italian senior side, leading the Olympic team to a bronze medal in the 2004 Olympics, and helping them to win the 2006 FIFA World Cup, winning three Man of the Match awards, as well as the Bronze Ball award given to the third best player of the tournament. In addition, he was elected to the Team of the Tournament. His popularity was certainly boosted. Pirlo has also represented the Italian senior side at the 2004, 2008 and 2012 UEFA European Championships, again winning three Man-of-the-Match awards, and being elected to the Team of the Tournament in the latter championship. He was also part of the 2009 and 2013 FIFA Confederations Cups, and the 2010 and 2014 FIFA World Cups. In 2016, he was left out of the team’s shortlist for Italy’s Euro 2016 squad. Even so, at full international level, Pirlo has gained 116 caps, being the fourth-most capped player in the history of the Italian national team. Aside from soccer, the player has been involved in his family’s business, owning a stake in their metal trading company called Elg Steel. He also runs his own vineyard in his homeland, producing around 20,000 bottles a year. Pirlo has written an autobiography called “Penso Quindi Gioco” (“I Think, Therefore I Play”). When speaking about his personal life, Pirlo was married to Deborah Roversi from 2001 to 2014, and they have two children together. Reportedly, their divorce was a result of Pirlo’s affair with a woman named Valentina Baldini.